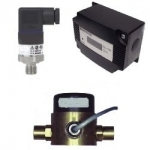 A range of Pressure Transducers / Transmitters for use in both Air and Liquid Environments. Industrial Pressure Sensors - types are available to handle most requirements. Liquid Static Pressure Sensor/Transmitter with 0-10Vdc or 4-20mA signal output. Ranges available from 0-500 mbar to 0-40bar. 1/4" BSP connection. 1m Cable. Multi-range Air pressure transmitter for monitoring Positive, Negative or Differential Pressure. The PTH has 8 jumper-selectable ranges (with a spread from -50pa to +2500pa) and either 0-10Vdc or 4-20mA output. Differential Air Pressure Transmitter/Sensor for monitoring positive, negative or differential pressures of up to 2000pa/20mbar. With 0-5V, 0-10Vdc or 4-20mA signal output. Ranges available from 0-250 to 0-2000 pa. Differential Air Pressure Transmitter/Sensor for monitoring positive, negative or differential pressures of up to 2000pa/20mbar. With 0-10Vdc or 4-20mA signal output. Ranges available from 0-100 to 0-2000 pa. LCD Display. Liquid Static Pressure Switch with adjustable switching threshold. Mains-rated output contacts. 1/2" BSP male connection. Please specify range required when ordering.